I had the great pleasure of receiving one of Appleyard London‘s exquisite bouquets this week – a wonderful gift that’s certainly brightening up my living room! A luxury flower delivery company based in the capital – but with delivery available nationwide – Appleyard London pride themselves on their boutique floral creations. Their ever-evolving range of bouquets features many fine elements including seasonal flowers, new and rare species of flowers, and on trend colours; there’s a bouquet for practically any occasion, event or recipient! Part of their Kensington flowers range – especially designed to brighten up Kensington homes – I received the Hot Toddy bouquet. 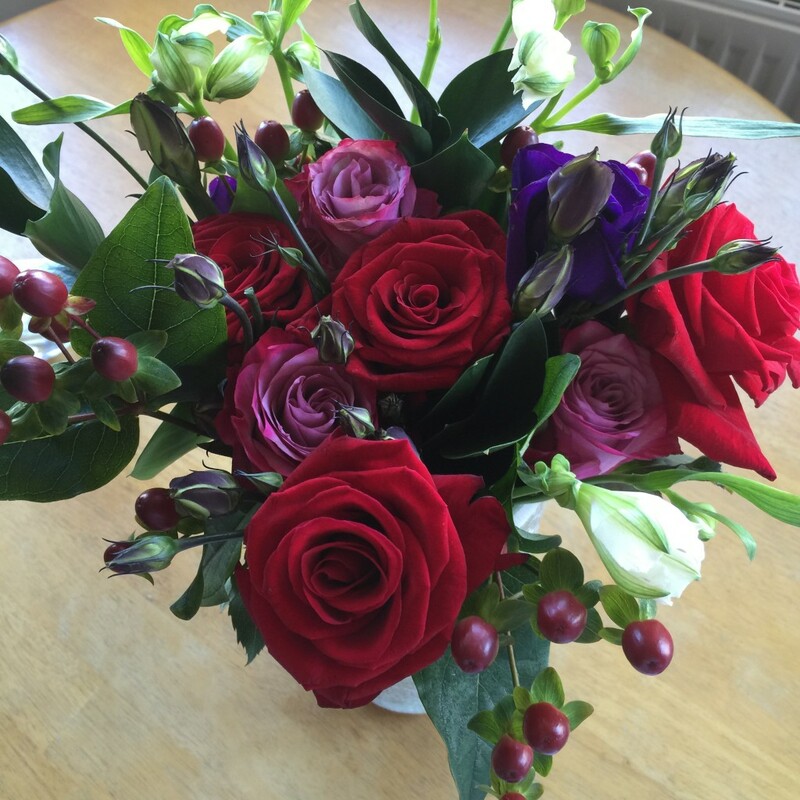 This seasonal selection is a mixture of grand prix and deep water roses, purple eustoma, red berries and autumnal birch. With wonderfully strong colours – largely a mixture of purple, red and pink, and with some white flourishes too – the Hot Toddy is a great bouquet for this time of year as we transition into autumn. And it’s certainly incredibly striking – definitely not one that blends into the background! The flowers came safely packaged in a sturdy and stylish box, so were well protected on the journey over to me. Lifting the flowers out, they were wrapped with white display paper and ribbon, and kept well hydrated, placed as they were in a small plastic box with a watered sponge in the base. The flowers are obviously meant to be transplanted into your own vase – and there’s clear instructions just in case you’re not quite au fait with this kind of thing – but I could easily have kept them displayed in their packaging for a while. Some of Appleyard London’s selection come with a box of Belgian chocolates, which was the case with the Hot Toddy bouquet – so, after carefully placing the flowers into a vase and trying to do my best at flower arranging, I treated myself to a tasty chocolate…or four. A few days in and the flowers have all opened up beautifully, with the rich red roses taking centre stage and looking fabulous amongst the background of purple, white and pink. They show absolutely no signs of fading and will last a good while yet…which is more than can be said for the Belgian chocolates that were snaffled up super-quick! Appleyard London’s Kensington Flowers range reflects the nature of our local area, particularly the two wonderful parks we have – Kensington Gardens and Holland Park. I personally think that all flowers in the range are absolutely gorgeous, and there’s bouquets with different colour settings and elements – so, something for all occasions or themes if you’re trying to match (or contrast) a bouquet to the decor in your own home. Appleyard London also have plenty of other collections and bouquets based on colour schemes, occasions, collections and more, so there’s sure to be something that suits your needs – whether you’re treating yourself, or picking something special for a loved one or friend. They also sell additional gifts and gift set packages – these include food hampers, wine, and flowers that are accompanied with candles or diffusers. Perfect if you’re looking for a little extra something to send out to a treasured recipient. You can specify your delivery date (ideal if you’re organising a surprise for someone, or planning ahead for someone’s birthday) or you can of course order next day flowers…astonishingly, as late as ordering by 9pm (on weekdays). Which is excellent news both for those who want a last-minute spruce up of their own homes, or if perhaps a special occasion has slipped your mind. Appleyard London Special Offer – Get 33% off orders! All in all, I’d certainly recommend Appleyard London for the quality of their service and their absolutely gorgeous flowers. And I have some good news for you too! If you’d like to try Appleyard London yourself, here’s a special offer to all readers in Kensington and Chelsea. Appleyard London have very kindly offered a special discount code that will allow you to make a saving of 33% on orders. This offer doesn’t expire so you can use it any time to brighten up your own home or if you’re looking to send flowers to someone else! And most of all, enjoy your gorgeous flowers from Appleyard London! I just love the Toddy bouquet! It is so elegant and beautiful!